It’s the season of thanks! Thanksgiving is tomorrow and I know everyone has their food, sports, and travel schedules planned but I’m betting most people haven’t had the chance to think about what the day really means. Since I’m having a more unconventional Thanksgiving (on vacation!) I’ve taken a moment of gratitude each day over the last few weeks. I’m thankful for my family and their health, my supportive and caring friends, my home, and my health. Though every year I include my health in things I’m thankful for I inevitably feel a little ill by the end of the weekend. 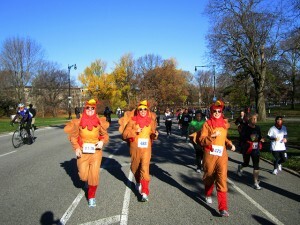 After years of regretting excessive indulgence I’ve finally figured out ways to keep those turkey pounds at bay. How many of you have made it part of your family tradition? Starting the day off of on a healthy note means you’re less likely to indulge. Though some people think exercising is an excuse to overeat, studies show you’re actually wired to select the healthier options. Secondly, small plates! Use the appetizer plate for your entree. Small plates mean smaller portions. Even if you go back for second helpings you’re still starting off with less. Lastly, you don’t have to clean your plate! Most of us have eyes bigger than our stomachs and even with smaller plates are still likely to over serve ourselves. If you’ve already enjoyed your meal and are stuffed there`s no reason to wipe your plate clean. Do you have other tips to prevent overeating (besides admirable will power)? We’d love to know.